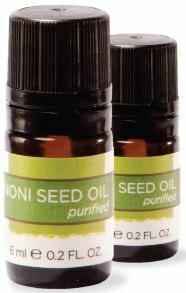 Morinda's Noni Seed Oil is the first and only noni seed essential oil in the world. It takes over 50,000 noni seeds to make just one ounce of this rare and precious oil. High in linoleic acid, Noni Seed Oil is a powerful ally in skin hydration and health. This patented essential oil absorbs easily and delivers intense moisture and relief to dry, irritated skin.